Good news keeps rolling in for America’s booming shale plays. Last week, the U.S. Energy Information Administration (EIA) released a report describing how the Marcellus Shale region is on track to supply 18% of total U.S. natural gas production in December. 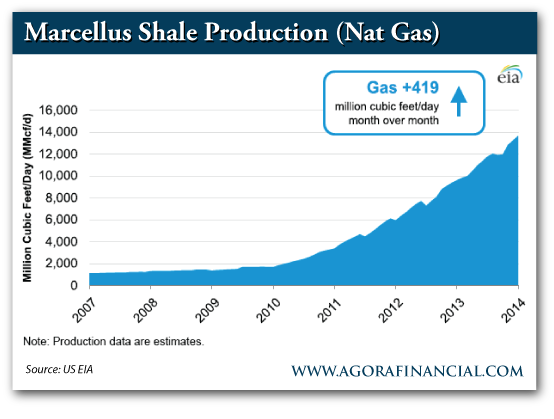 Production in the Marcellus shale is booming. Here’s the first chart. Basically, more and more “takeaway capacity” has come online in the past year. This is despite a flat rig count, according to data from Baker Hughes. 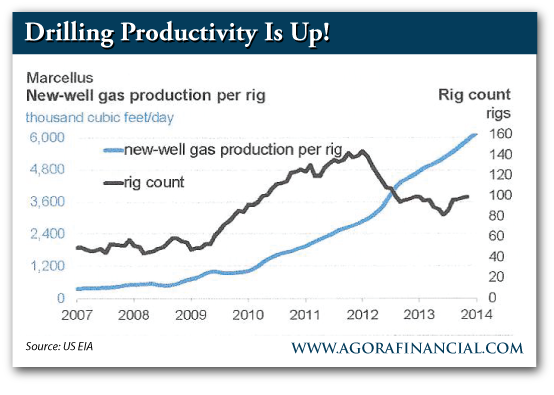 In other words, the same number of rigs are drilling more wells. That comes with improved learning curves and better efficiencies based on experience in the field. As things stand, Marcellus gas output exceeded 13 billion cubic feet per day (bcf/d) in November and will top 14 bcf/d in December. Based on wells already drilled and ready to tie into the distribution grid, expect to see over 400 million cubic feet per day (mmcf/d) of additional “new” gas coming online from December to January. Thus, with a fair set of rules and regs, more and more PA-WV-OH operators have leased land and drilled wells, gaining valuable experience and delivering hydrocarbons. Now we’re several years into the play. We’ve reached the point where output from new wells is growing fast. In terms of engineering and well building, operators are drilling longer wells — called “laterals” — and adding more down-hole production sections, called “frack stages.” This is delivering more output from more stages, in longer wells. Meanwhile, more pipelines and processing facilities are coming online – long-time readers of my newsletter, Outstanding Investments, know that I like MarkWest Energy (MWE) in this space. These new systems enable formerly shut-in wells to come online, while increasing overall production that feeds the marketplace. At the cash register, “more gas” has pushed the average price down. By one key metric, the forward price of natural gas at the Columbia Gas Transmission Appalachia hub ($3.93 per mcf) is now below Louisiana’s benchmark Henry Hub price ($4.00 per mcf). In addition to natural gas, a key driver for Marcellus output is associated oil and other natural gas liquids (NGLs). These liquids come up the well casing with the gas and change the overall economics of drilling. That is, a “break even” gas program becomes a highly profitable gas-oil-NGL program. In other words, oil companies aren’t drilling wells in order to lose money. That’s not the idea. I’ve heard many people criticize new “shale gale” plays across the country. Close to home, I’ve encountered many Marcellus development critics here in Pennsylvania. The best of anti-shale critiques include points like “energy return on energy investment” (EROEI) is poor. In other words, EROEI today is lower than in the olden days of drilling classic “textbook” oil formations. Well, yes. That’s basically true. Shale fracking has lower EROEI than poking holes into oil- and gas-rich reservoirs with fabulous porosity and permeability. But so what? Relatively low EROEI doesn’t mean that what works right now — directional laterals and multistage fracking in hydrocarbon-rich shale — doesn’t work. Clearly, it works. We’re getting gas and oil, right? OK, it costs more to drill the new wells than to drill the old wells. Again, so what? Pay up. Also, critics claim that overall, fracking is too energy-intensive for what you get back. Part of it is that right now, gas prices are “too low.” Another way of saying it is that in the big scheme of things, shale development is a flash in the pan. It will all peter out in a few years. It just won’t last. Then again, we’ll all live long enough to find out, right? On these last points, we get into all manner of raw speculation over energy and its underlying economics. We know the price of natural gas today. We can look at futures markets for prices tomorrow, next week, next month, next year, etc. But for how long can this new fracking idea deliver the goods? Beats me, but the data indicate that it’s working now. The trends look favorable. My investment caution here is NOT to dismiss any of the critiques outright. Beware addressing important, complicated issues with a bumper-sticker mentality. When it comes to energy development, you need to stay focused on thermodynamics and classical economics. Follow the iron discipline of physics and math. There’s no free lunch. Moving ahead, we MUST keep our eyes open — not to mention our minds. Also, longtime readers have read Peak Oil discussions from me over the years. I’ve written about the topic since my first Whiskey & Gunpowder article in November 2004. With me, it goes back farther than that, to be sure. I’ve worried about energy issues for a long time, and in 2004, Agora Financial was good enough to give me a public outlet. Going back even further, I had the pleasure of hearing the original Peak Oil thesis from none other than M. King Hubbert, at a talk he gave at Harvard back in 1977. Long story, and one I’ve discussed before. All that, and my first job out of Harvard was working in West Texas for the old Gulf Oil Co., in the Permian Basin. Specifically, I worked west of Odessa, in and around the massive North Ward Estes oil field, in Ward and Winkler counties. We used to lament the “irreversible decline” of our wells. On that last point, the Permian Basin is now one of America’s fastest-growing oil-producing regions, based on directional drilling and fracking. Indeed, some of the best new oil plays are formations that we used to drill right through when I was working for Gulf. How things change! Of course, back then, we knew all about the oil and gas in tight formations. We could log the hydrocarbons and such — and we almost always used Schlumberger (SLB) to do the work. But we just didn’t have technology to get that gas and oil out of the rocks. We were several decades too early. For now, new directional drilling technology — and fracking — is changing the world. It’s delivering energy in immense volumes, as just the new news out of the Marcellus shows — see above. All that and more, across the U.S. and Canada. Soon in Mexico. Perhaps in Europe, and then Africa, the Middle East, China, South America and more. The shale revolution is delivering energy and feedstock. That’s a fact. New tech is delivering product, creating cash flow and providing investment opportunity. That’s a fact too. 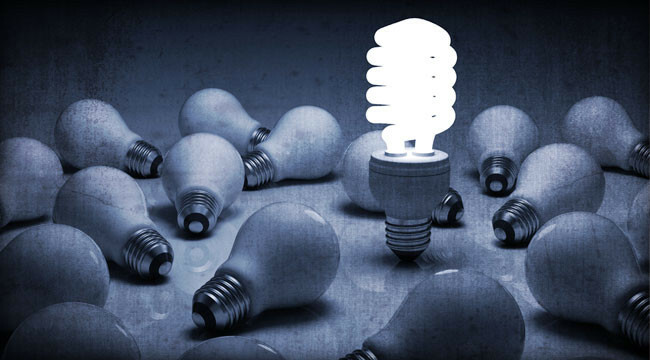 For now, the new energy revolution in North America is changing the world. It’ll last for a while, I suspect — all the critiques notwithstanding. Along the way, it’s investable. That’s all for now. Have a good week, and thanks for reading. P.S. Did you know America’s oil boom… almost didn’t happen? It’s true… The U.S. oil boom was almost dead in the water because of a simple miscalculation America has made over the last 40 years. However, the boom IS happening… but because of this “error,” it spawned a second, even larger SUPER-BOOM! And many could make huge profits because of it. I gave readers of the Daily Resource Hunter email edition a unique chance to discover this second super-boom… and all the profits that could accompany it. If you didn’t get it, not to worry… You can sign up for the Daily Resource Hunter, for free, right here, and make sure you never miss another opportunity like this.